In late June/ early July 2018 we had a two and a half week holiday to Vanuatu planned. This would be our first visit to this small Pacific nation. But just a week or so into the trip we had to return to Australia due to an unexpected serious illness of a close family member. Our short time in Vanuatu had not been blessed with particularly good weather. Most days were cloudy and windy, with temperatures in the low to mid 20s. All in all it was not the luxurious tropical beach holiday we’d envisaged. 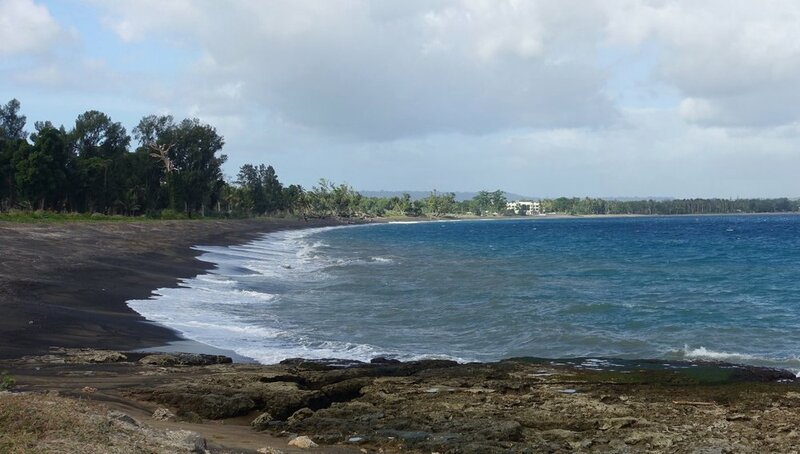 As bloggers we’d planned to do posts on each of the three islands we intended to visit – Efate, Tanna and Espiritu Santo, as well as a travellers’ tips post. Our truncated stay meant that we had reduced time on just two islands – Efate and Tanna. So, what does one say about such a short visit? We barely scratched the surface of Vanuatu. However, even this brief contact left us with some good experiences and lasting impressions of the country and the people we met. To get this across to readers we’ve produced two posts – this first one is as a short diary of our journey and the second has a few tips that we gleaned along the way that some might find useful. So, without further ado here is our Vanuatu Diary. 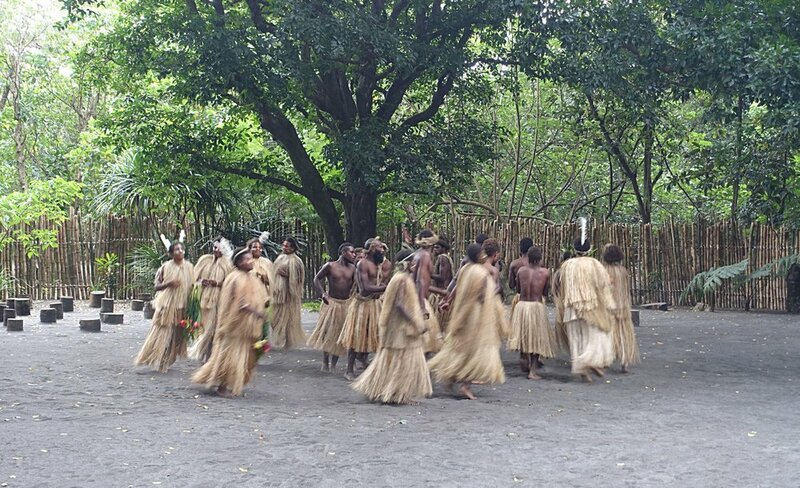 Vanuatu is easily accessed from Australia, and unsurprisingly Australia is its biggest tourist market. The capital, Port Vila, is on the island of Efate. It is a three and a half hour flight from Sydney and is just a couple of hours from Brisbane. The country is made up of over 80 islands and has a population of 281,500. We flew into Port Vila on a blustery afternoon and taxied to our accommodation at Poppy’s. This had a good location on a lagoon, nice, well-kept gardens with clean and comfortable rooms. 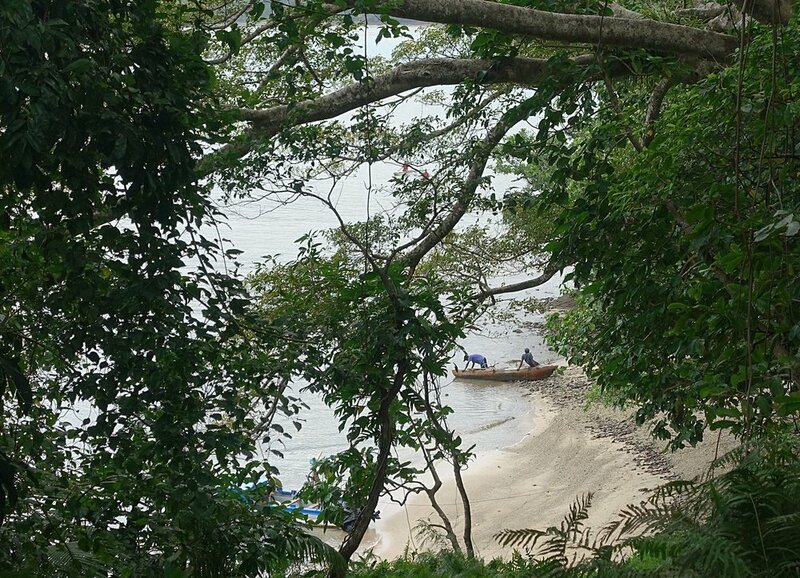 There is also a treehouse in a huge fig tree where you can relax and enjoy the view. Unfortunately, the weather didn’t lend itself to swimming. We walked the 15 minutes into town. Friendly locals greeted us along the way. We strolled the newly renovated waterfront promenade and enjoyed a cleansing ale at the Nambawan Café. Nambawan? Sounds Malay or maybe Thai. We tried pronouncing it as NAM-ba-wan and Nam-BA-wan. Then the penny dropped Nam-ba-WAN Number One! Which is Bislama, the local lingua franca which is a pidgin language based on English. 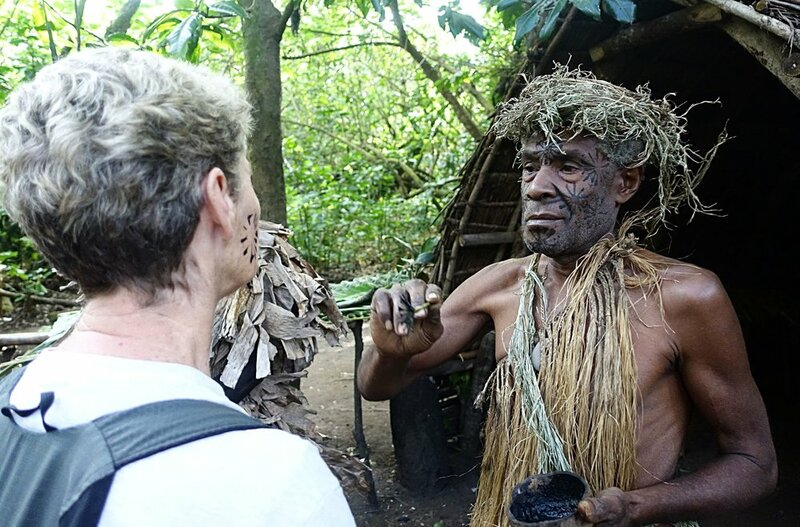 Not only do most ni-Vans (people of Vanuatu) speak Bislama, their own tribal language (there’s 32 on Tanna alone) several other neighbouring tribal languages, but they also speak English and French, which they learn at school. Pretty impressive. Re nambawan we later saw nambawan toilet roll and numerous other services and products labelled as such. Bialama Quiz: Here is a receipt we received. Can you work out the meaning of these terms: kas risit; bisnis nem; mane we hemi; and signeja? And what about these phrases: Yu gat haos blong slip? Hamas farawe long ia? And Singaot polis! Answers at the end. For day two we had pre-booked a Discover Scuba (introductory dive) with Big Blue Vanuatu. Cally had done PADI training many years ago but was a bit rusty, while Ken was a total newbie to scuba diving. The morning involved a short pool session where we were taught to clear our regulators (the breathing bit), clear our masks when submerged, and equalise the pressure in our ears as we moved up and down through depth. In the afternoon we’d expected to walk in with the gear off a beach and swim about in a few metres of water. Not so. It was literally in at the deep end. We headed out from port in the Deep Blue boat, The Lady, to a good spot. Then it was over the side in 10 – 12 metres of water with our instructor beside us. All went well, and it was a great experience albeit a little nervous making when we first discovered what we were in for. The downside of the dive for Ken was developing blocked ears that refused to clear, so day three began at a local Port Vila health clinic. A quick syringing and the all clear was sounded. “That’ll be 7800 vatu,” said the receptionist. A quick mental calculation came up with a figure of around $A95. “7800 vatu, that seems like a lot, can you check the price please?” “7800, that’s correct” she repeated. Special tourist price no doubt. Note to self and anyone else with waxy ears – get them syringed before you go on a diving holiday, especially in Vanuatu. Problem solved we checked out the local market. Lots of excellent produce, but it also showed us that food prices in Vanuatu were fairly high for the locals. We wanted to see beyond Port Vila so arranged a hire car for a day through Poppy’s. At around $A80 plus petrol the total cost was about the same as an ear syringing. Efate is roughly round. It takes about two and a half hours to complete the 122km sealed ring road circuit. We headed out of town in an anticlockwise direction with a plan to start by visiting Eton Beach, reputedly Efate’s best white sand beach. And yes, it looked like a nice beach, on the right day. Unfortunately, it was very windy and not conducive to beach going. There is also a 500vt ($A6) per person entry charge so we didn’t stay. Instead we cruised slowly along the road, stopping to check out the view from time to time. Towards the end of the drive we headed up a side road along the west side of Mele Bay, which is just west of Port Vila. Our Lonely Planet guide recommended the Summit Lookout. We drove all the way to the end of the road without any indication of signage pointing the way to the Summit. Eventually some helpful locals flagged us down and asked what we were looking for. They then explained that the Summit was no longer open due to Cyclone Pam in 2015. Oh well, we still had a nice drive. 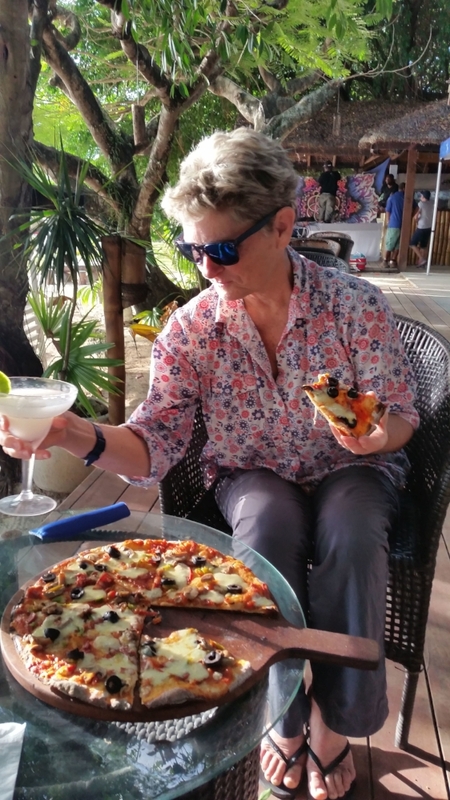 Time for margaritas and gourmet pizza at the Banyan Beach Bar in Port Vila. Both were excellent. The flight to Tanna only took about 45 minutes. We arrived at the airport which is on the west coast of the island close to its main town Lenakel. We were met by our accommodation host for the next two nights, Mike from Yasur View Bungalows. This is on the east side of the island close to Mt Yasur, one of the world’s most accessible active volcanoes. 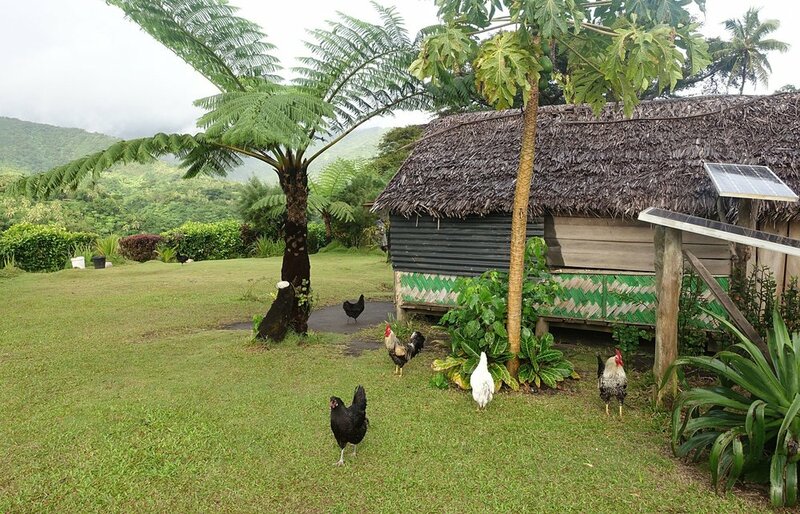 It’s a one and a half hour drive from the airport to the east side of Tanna. As we were starting out on the drive Mike asked us when we’d intended to visit the volcano. We said “tonight”. In which case we’d have to get a wriggle on as the tour meets at 4.00pm and leaves at 5.00pm for the volcano. 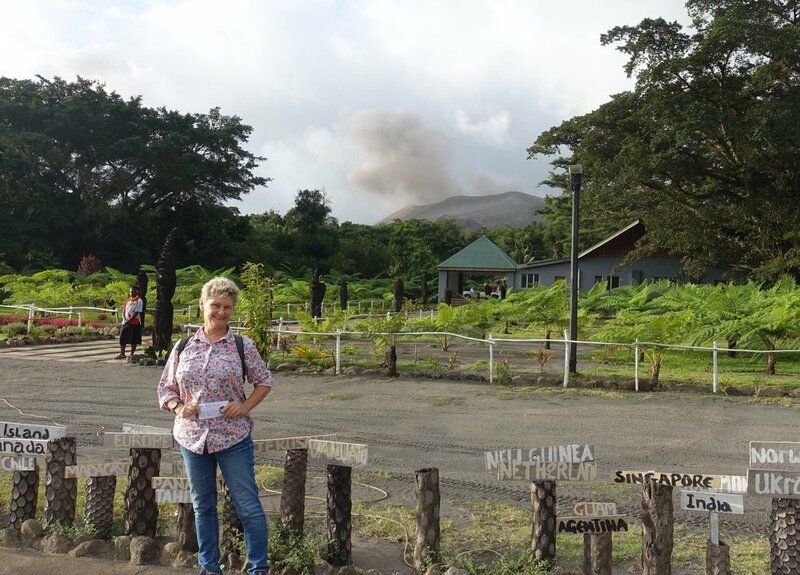 We’d read in our guide book that you could arrange to visit the volcano rim via your guest house or you could even walk up to it from the park entrance. Mike informed us that this was no longer the case. 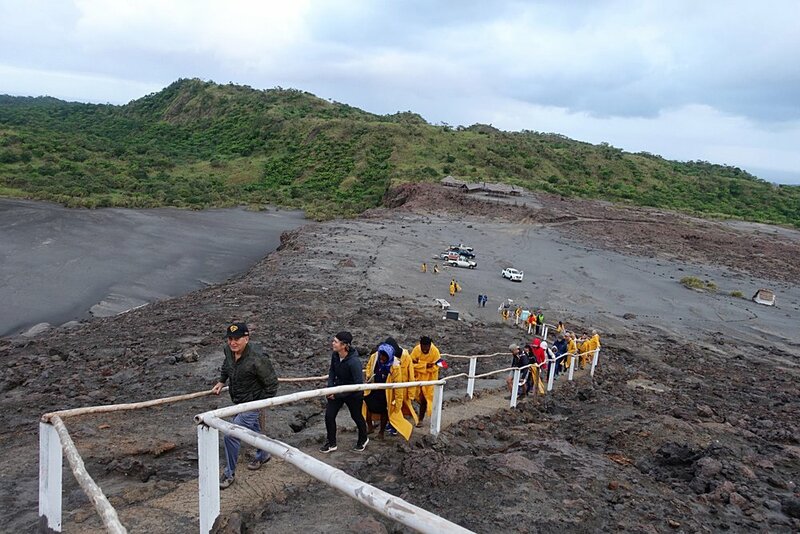 The only way to travel up the volcano was via an organised group run from the newly completed visitors’ centre. The set price is 9750vt (c.$A120/ $US87). Payment in cash only. We were a little surprised at this news and also realised that we did not have enough vatu in cash. Fortunately, Tanna now has an ATM, so we were able to cash up before starting our traverse of the island. 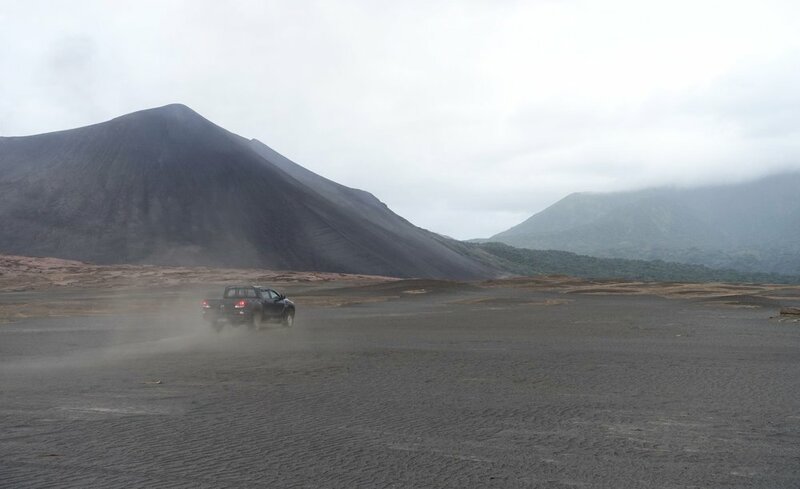 The trip included driving across the other-worldly ash plan that surrounds Mt Yasur. We made it to the visitors’ centre just as proceedings were commencing. After a short cultural dance display, it was into a number of waiting vehicles and we drove to near the top of the volcano’s crater. A short walk from the car park took us to the crater rim. Here we spent a little over an hour watching the fireworks and hearing the belching and booming of this volatile mountain. As the sun set the show became more dramatic with the glow from the volcano becoming more pronounced. Overall, we stayed around an hour and a quarter. This was definitely an experience worth having. Yasur View Bungalows (not to be confused with Yasur View Lodge which is near the park entrance) sits in the hills across from the park with fantastic views of volcano. After breakfast we sat in the sun reading and looking up every now and then to see Mt Yasur’s latest ash cloud rising into the blue sky. The activity from the mountain was fairly continuous. Apparently, it is closely monitored by vulcanologists who will trigger a closure of the park, and even an evacuation of the area, if needed. For the afternoon Mike had arranged for us to do the “Ancestors Cultural Tour”. He hadn’t really explained what would be involved but assured us that we’d find it worthwhile. One of Mike’s relatives walked us down to the village near the volcano park. We turned off the main (dirt) road/track and waked down a non-descript path in the bush. We stopped in front of a massive fig tree. He asked us to wait while he checked if they were ready for us. He then disappeared in between the air roots of the giant fig. It appeared clear to us at this point that we were the only ones on the “tour”. Our guide re-emerged after a few minutes and confirmed that they we indeed ready. He beckoned us to head into the root curtains and added “don’t be scared, it’ll be fine”. On the other side of the fig tree it opened into a clearing, but there was no one there to greet us. We walked slowly forward a few metres and then all hell broke loose. We were “attacked” from all sides by spear and club wielding warriors of various ages and sizes, shouting angrily and very loudly. Then, abruptly, it stopped and they all fled into the bush, except one chap who calmly introduced himself as Patrick, our guide. Over the next 45 minutes the group of a dozen or so performers demonstrated various aspects of their traditional culture (known as kastom). This included hunting and trapping. How to make a stretcher from local plants for an injured warrior. At a traditional “village” we met the chief and had explained his crucial role in deciding on farming practices and timing of crop plantings and the magical powers he uses with these processes. It all finished with a farewell song from the group. It was a fascinating little tour put on by local villagers intent on preserving their kastom and passing this on to the younger generation. The fact that half the performers were children who were centrally involved will help to guarantee that they will succeed. 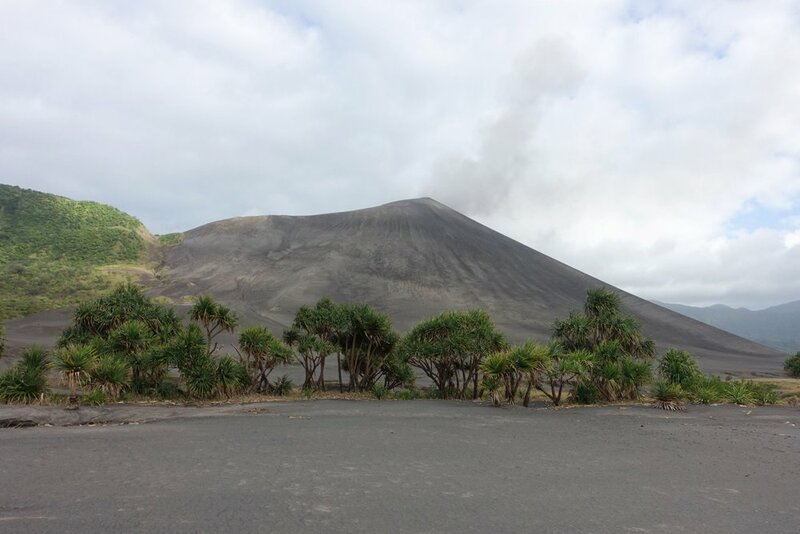 Mt Yasur is a little way inland from the coast, so for our last night in east Tanna we had arranged to stay at Port Resolution around 8 kms away. This is a popular spot for yachties. And our accommodation was, in fact, the Port Resolution Yacht Club. After checking in we spent the afternoon at the nearby white sand beach, one of Tanna’s best. It was a little breezy but Cally finally got in a bit of snorkelling and Ken had a dip. It was then back to the yacht club for dinner. Next morning, we drove back across to the west side of the island where we had two nights booked at Tanna Evergreen Resort, just north of the airport. Tanna Evergreen has cut a small channel through the rock and coral platform at the front of the resort to allow access to good snorkelling. This was one of the main attractions for choosing this accommodation. The public area at the resort was also our first wifi internet connection since arriving on Tanna. Shortly after logging on we received a message that a close relative of Ken’s was seriously ill and in hospital. At this point our mission was to return to Australia as soon as possible. The helpful people at Tanna Evergreen and Air Vanuatu assisted us to organise flights back to Efate for the next morning and Sydney the day after. Back in Port Vila we spent our last night of our short trip to Vanuatu at Chantillys, a nice, comfortable hotel walking distance to the centre of town. Next morning it was up early for the 7.00am flight to Sydney. The abrupt end to our trip meant that we missed out on visiting Espiritu Santo, and it also reduced the number of activities we’d planned for Efate and Tanna. But, despite this, we have enduring memories from our time there – of the very friendly people we encountered all along the way and also of the feeling of being in a safe destination, epitomised by its strong cultural traditions that the ni-Van people greatly value and work to maintain. Bislama Quiz Answers: kas risit – cash receipt; bisnis nem – business name; mane we hemi - ? we’re still trying to work this one out, but it’s to do with money; and signeja - signature? Phrases: Yu gat haos blong slip – Do you have a house I can sleep in?? Hamas farawe long ia – How far is it from here? And Singaot polis! – Call the police!